I am delighted to announce that I have joined Team Pallatrax. Pallatrax are a growing company. They are incredibly innovative and forward thinking. It’s products like their Dried Naturals and Hidra range that highlight just how much these guys are market leaders when it comes to innovative and imaginative products. Add to that an incredible and thoroughly tested range of boilies, pellets, glugs and sprays and it isn’t difficult to see why they are expanding so rapidly. The Stonze is a remarkable success story in it’s own right. They have produced a product that is virtually undetectable by fish and unique in the world of angling. The product is Internationally patented and award winning and we’ll be seeing a lot more world wide focus on these over the coming seasons I’m sure. The other tremendous benefit of the Stonze is that they are environmentally friendly, which takes some doing in this day and age! I haven’t even touched on their impressive range of terminal tackle either. Pallatrax’s ‘The Hook’ has been around now for a couple of seasons and has proven to be a solid, dependable hook even in the most extreme conditions. 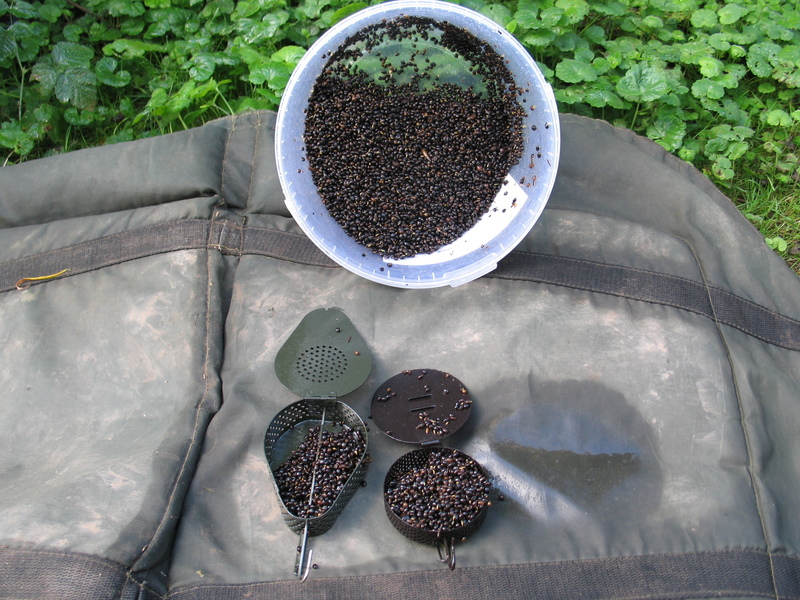 I’ve been using them for some time and they are an exceptional hook and in a great range of sizes too, not just big. Of course that’s the tip of the iceberg really, they have so much more to offer than just hooks. Check out the Pallatrax website for a full range of products and some brilliant videos with Simon Pomeroy, highlighting some of the great bait ideas they have come up with. It really is an eye opener. Roach and chub here I come! 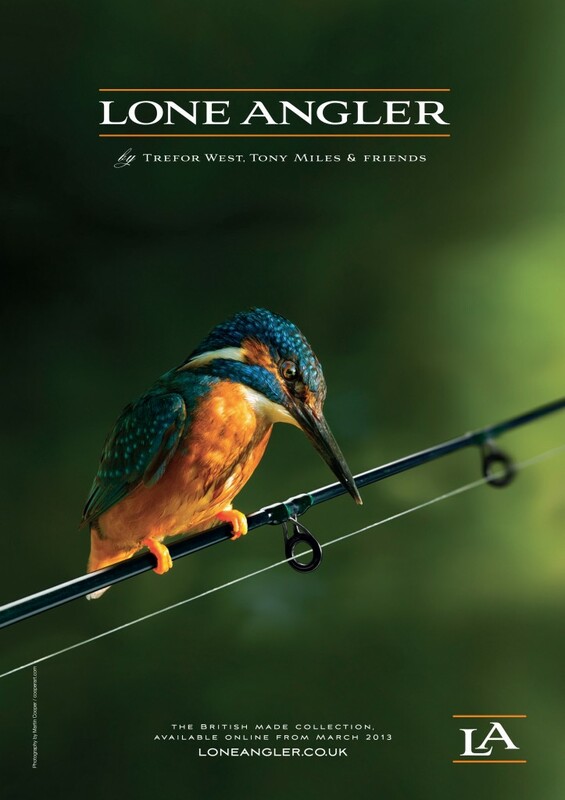 Then of course there is the Lone Angler range of products that hit the market recently. Lone Angler is a sister company of Pallatrax and comes under the Pallatrax umbrella. Headed by that barbel catching God Trefor West, you know that the range has been thoroughly field tested and made to the very highest standards. So I’m really looking forward to experimenting with baits and the Stonze system over the coming months. I’ve already got a hundred and one ideas swirling around in my head! I can’t wait to get out and start utilising some of these superb products. My thanks go to Simon Pomeroy and the Mad Hatter himself Jez Brown for bringing me into the fold. Cheers guys. Wooes to his wan-worn cheek the pleasant gale. How wildly novel on his senses float! Thus once again to hear the warbling woodland choir. Couldn’t have put it better myself, I must say! Anyway the Association of Barbel Fishers were holding their annual AGM at Newark on Saturday 12th and as an Officer of the association I intended to attend. It seemed pointless driving all of that way just for a meeting and so Geoff and I decided to go earlier in the week and do a spot of Trenting or more precisely; barbelling. I booked some day tickets for Tuesday through to Saturday and hoped that the weather would hold. We arrived on Tuesday evening. During the afternoon it was an amazing 22c, however by the following morning the temperature had dropped to a rather cool 14-15c and the wind was fresh to say the least. A northerly had sprung up and it was blowing at 25mph and gusting to well over 35mph. Wow what a difference and what a bloody shock to the system. We’ve had a terrific summer really and September and early October have been outstanding. So I won’t be complaining. I might add the rain stayed off, at least whilst we were actually fishing. And thank goodness for that. Persistent rain and high winds really don’t do it for me I’m afraid. That’s when its time to head to the pub. 🙂 and then things get really wet and windy, particularly after a few picked eggs……!! Tuesday evening was very mild and so we decided to grab a couple of hours on the river. Geoff and I shared a swim and Geoff was soon in. The chub were active it seemed and Geoff ended up with a couple of nice fish. I managed a bream and then a nice feisty barbel of 8lb 5oz. We were both tired and the action was pretty slow to be honest, despite the seemingly ideal conditions and so we headed to our pits for some much needed sleep. We don’t often start early if we are going to be fishing into darkness and these few days were not going to be any different. By now the wind was blowing a hooley and the temperatures were dropping. Still its nothing that a full English wouldn’t sort out. We headed to Waitrose (we’re posh don’t you know) and had the works in the restaurant (that’s cafe to you peasants) and grabbed a few provisions before heading back to the caravan to load the car and get off fishing. Flasks made, food packed and we were on our way. After a good walk checking out a few spots Geoff and I finally decided on a couple of swims. Although a bit cooler today the temperature seemed to have stabilised at around 15c, so not too bad considering the time of year. Fortunately for me I seemed to find a swim with a few fish in. By now it was around 3pm. 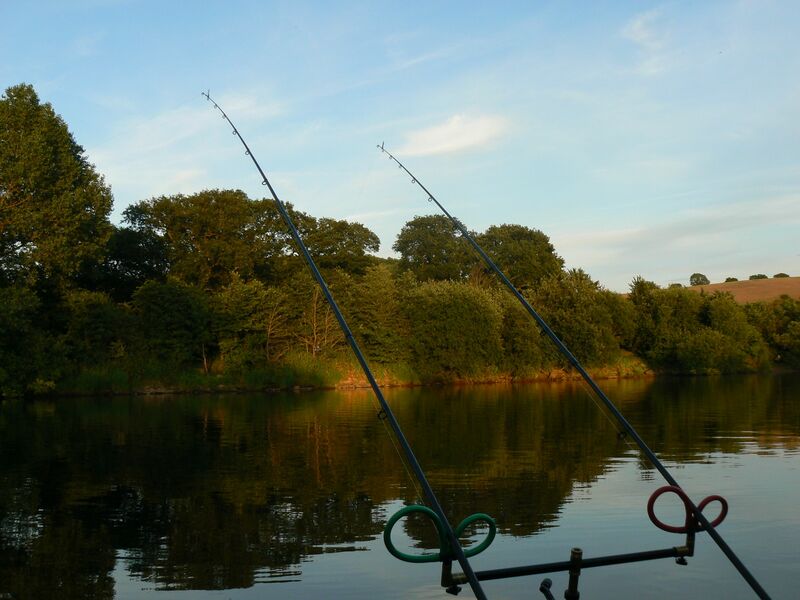 I had decided to fish two rods; one for barbel and the other a Drennan quiver tip and fish for roach or bream. This was set up with 6lb mainline and a flurocarbon hooklink of 5lbs. Bait was sweetcorn and maggots with maggots or hemp in the blockend feeder. Regular casting of both rods would get a bed of bait down and hopefully attract some interest. 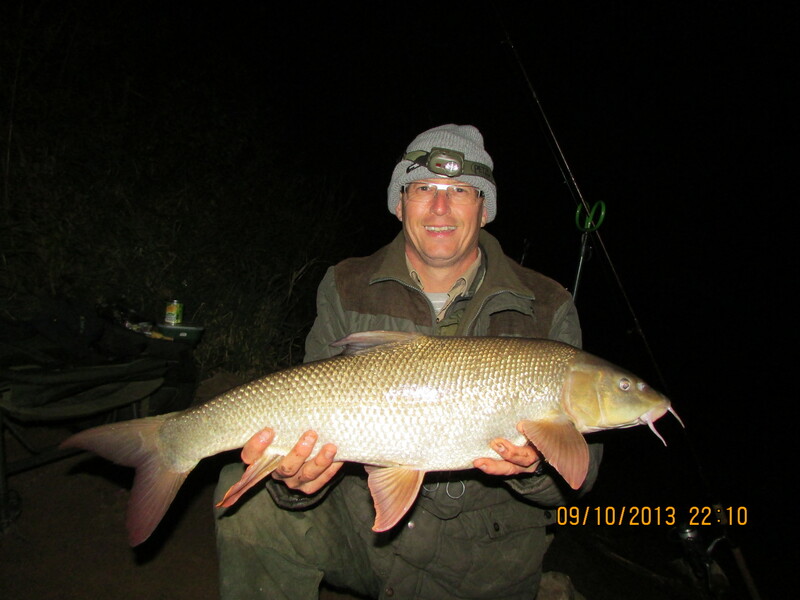 It was the barbel rod that hooped over first and a small barbel of around 3-4lbs was soon returned. 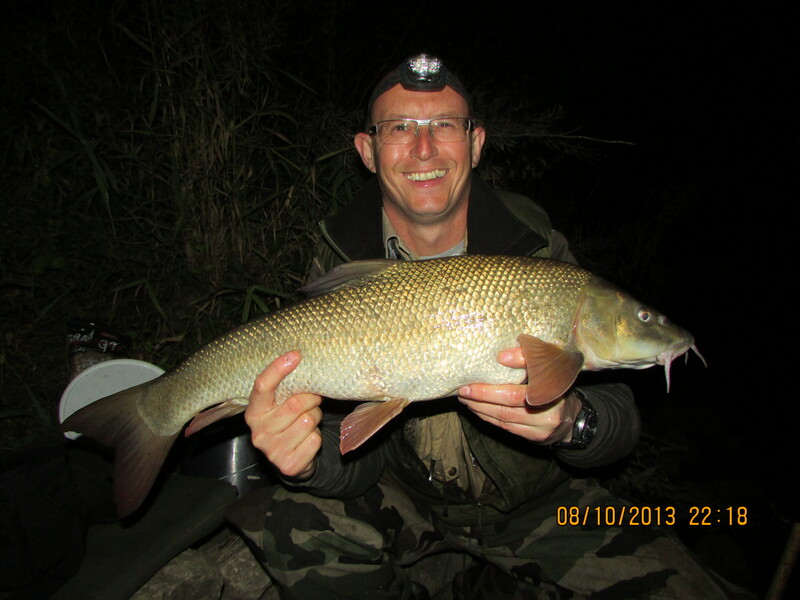 At this time of the year the barbel seem to fight particularly hard. They really do give it their all, which is great fun. Meanwhile the quiver rod registered the odd twitch but otherwise nothing much. 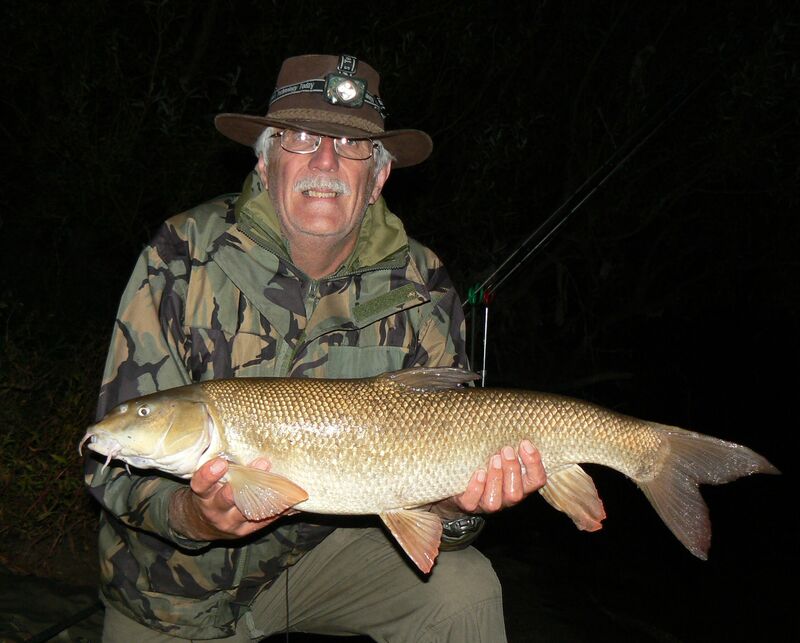 The barbel rod did the old three foot twitch routine again and a similar sized barbel was subdued. The light was fading fast and I decided to change the bait on the quiver rod to a single banded elips pellet. The theory being that the roach and bream are used to seeing pellets here and therefore that’s probably what they mainly feed on. The plan worked but not for the aforementioned species. As the quiver tip bent round at an alarming rate, it had to be barbus barbus on the other end. 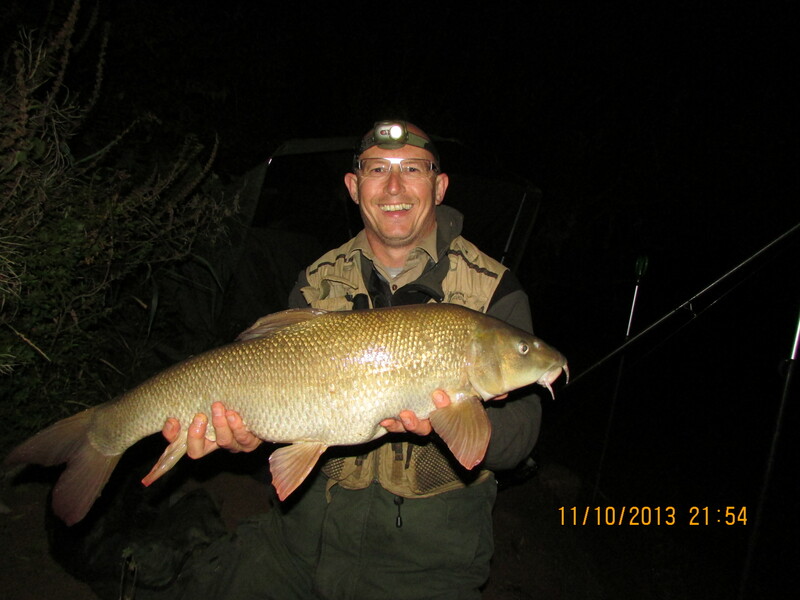 After a great fight another fine barbel was returned and a short while later round it went again. I ended up with 7 barbel to 9lbs and a few good bream to around 6lbs. A pretty good result as far as I was concerned. Geoff managed a couple of chub but couldn’t find the barbel. The following morning (late of course) found us at the farm shop where the breakfast is first class. The garden centre and shop are full of interesting bits and pieces and with a great selection of cakes, biscuits, sausage rolls and other consumable paraphernalia to keep you occupied. 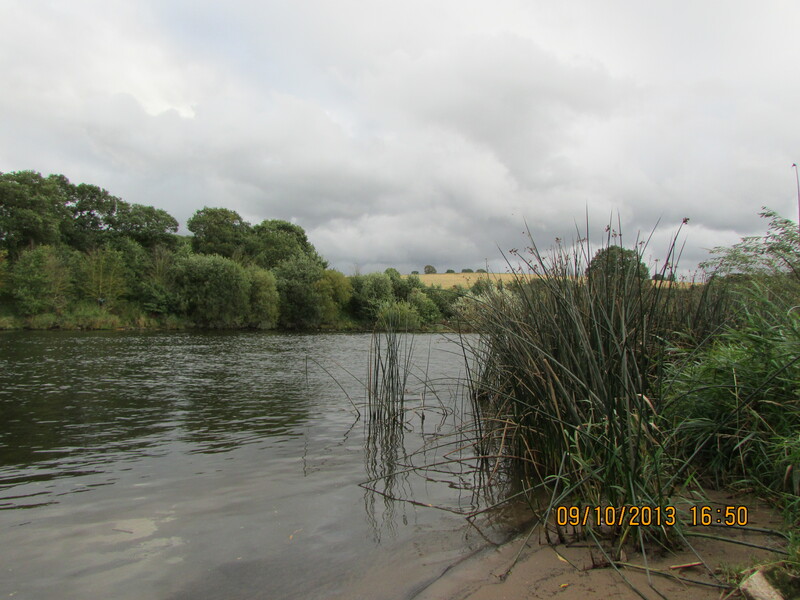 Once again we headed to the river around 2-2.30pm and picked a couple of swims. The wind seemed even stronger today and the sky was dark and foreboding. Rain was a distinct possibility but we hoped that with such a strong wind it would keep pushing the rain away and so it turned out, as it remained dry throughout our session. 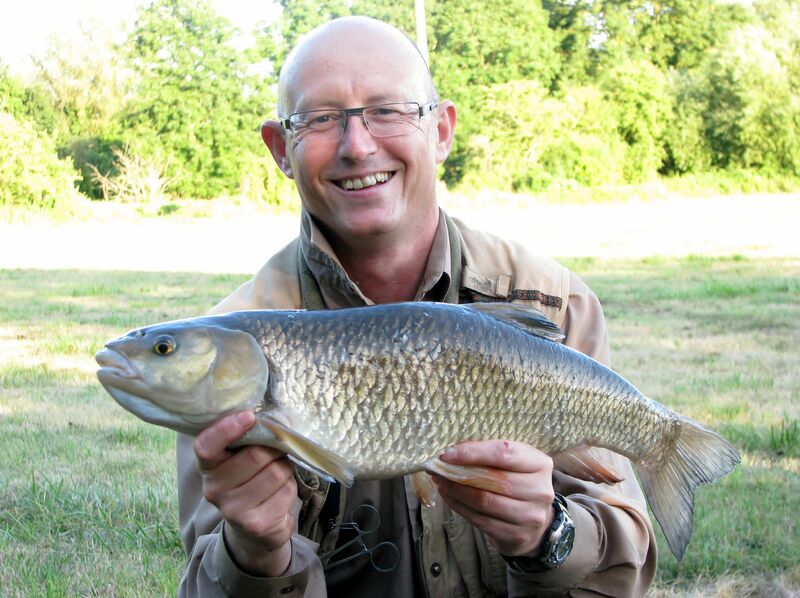 This time Geoff found the fish taking 4 barbel to 10lb 9oz and a few chub. I only found one barbel, some chub and bream. However one chub was probably over 5lbs and bream to around 6lb. Eventually the temperatures dropped to just 7c and so at around 9pm we called it a day. We returned for our last session the following day having tried out Morrison’s breakfast first of course. Not at all bad by the way. Plenty of food and good value. The rain had put us off going too early but eventually we arrived at around 2.30. It was still threatening rain and the forecast was pretty grim. We decided to stay put until the rain started and then we’d beat a hasty retreat. Luckily for us the rain never materialised and we remained dry but somewhat wind beaten. This time I enjoyed some really good action. The rods were whacking round quite frequently and throughout the entire session. 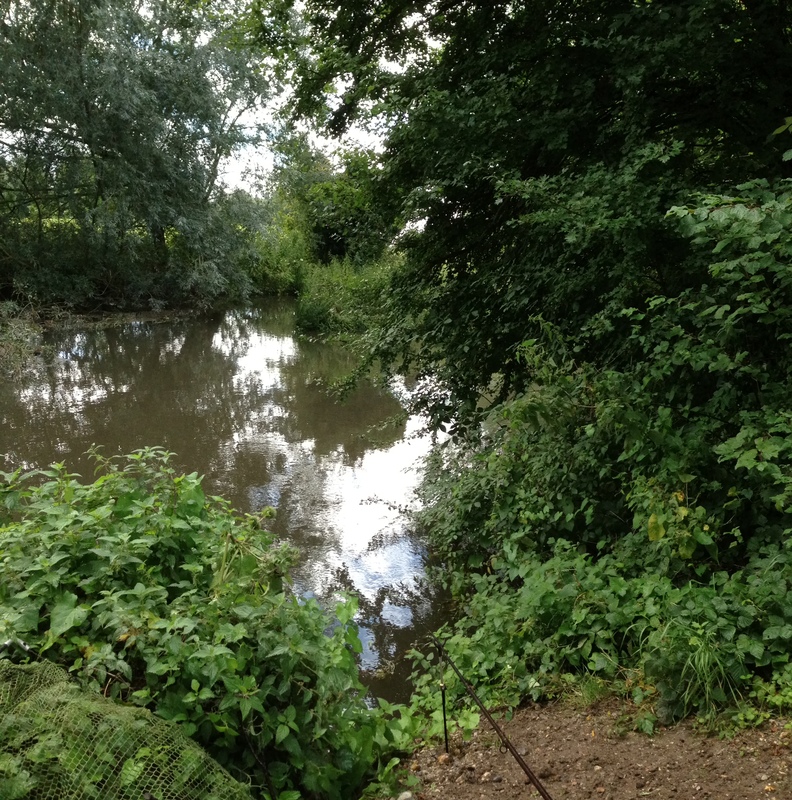 There was the odd quiet moment but otherwise steady action from the barbel, chub and bream. I ended up with 7 barbel to 10lb 7oz, 8-10 chub to over 5lb and a couple of nice bream (if such a thing is possible!). Sadly Geoff struggled a little but I think had 1 barbel and some nice chub. we ended the few days here with over 20 barbel between us and with two doubles and a bucket load of chub and bream, we felt pretty satisfied with events. It’s been slow going this season so to get this much action was very rewarding I must say. As ever thanks to Geoff for his company. On the Saturday we attended the Association of Barbel Fisher’s AGM. I guess there were around 16/17 of us there and we had a very good and worthwhile meeting. After the usual formal procedures and votes we were able to discuss what the ABF should do next and this created a very positive and lively discussion. Lots of sensible ideas were muted and some good action will result. I am certain that over the next few years the ABF will go from strength to strength. We have some great people on board now and with Steve Richardson as our new secretary, I personally feel we are in a very strong position indeed. Well it’s been a tough old season, that’s for sure. Geoff, Kevin and I have been targeting a Thames tributary and thus far it’s proven to be a tough nut to crack. Although both Kevin and I have lost one barbel apiece, only Geoff has actually managed to bank a small barbel of around 6lbs. I guess I must have done around 8-10 sessions here, comprising of a Tuesday evening and pretty much all day on Wednesdays. We have at least had some nice chub, thank goodness. I have managed a nice brace of mid ‘5’s’ and one really good chub of 6lb 1oz. I love catching chub and to me they are a real bonus. 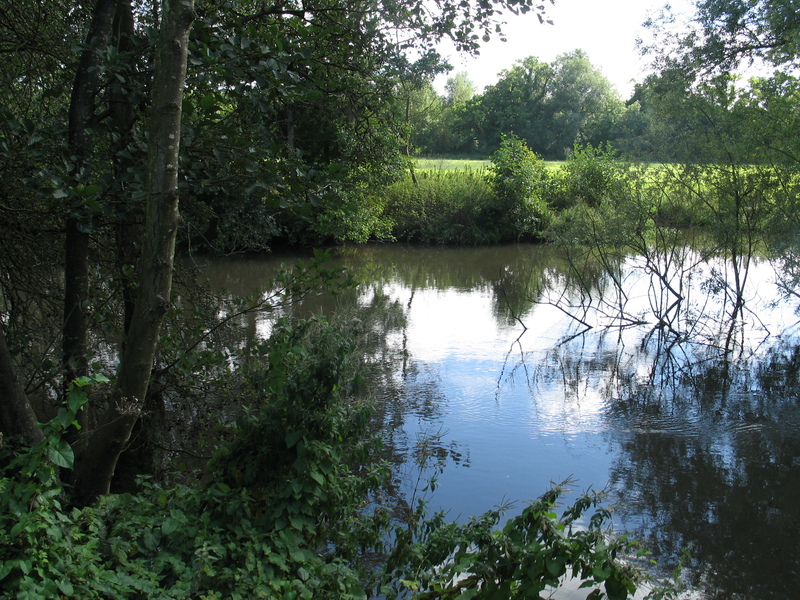 I’m really looking forward to fishing here throughout the winter with simple link leger tactics using breadcrust or lob worms or trotting a float through a few mouthwatering swims. 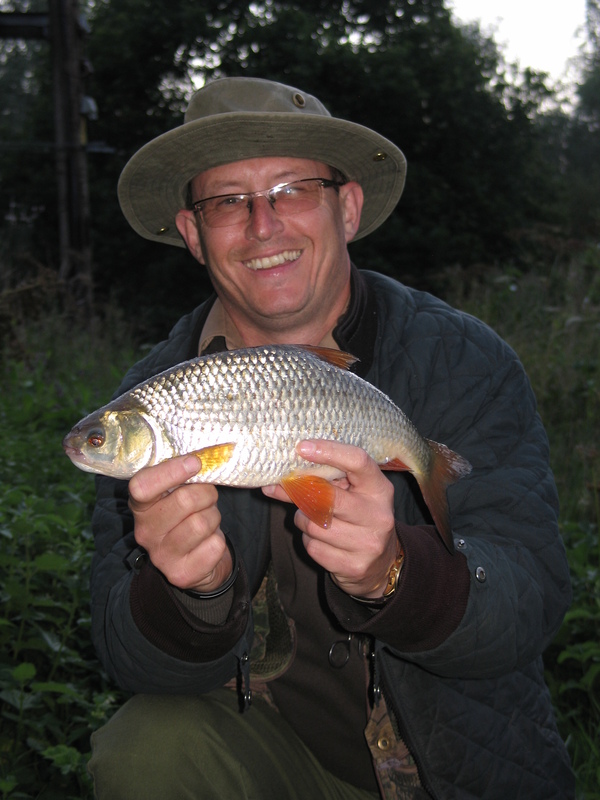 Maggot and caster never fail to produce a chub or two in the right conditions, so we’ll see what the winter brings us. I did have a short break from the rivers due to the poor sport and headed off to Marsh Farm in search of some tench and crucians. I only did two short evening sessions. 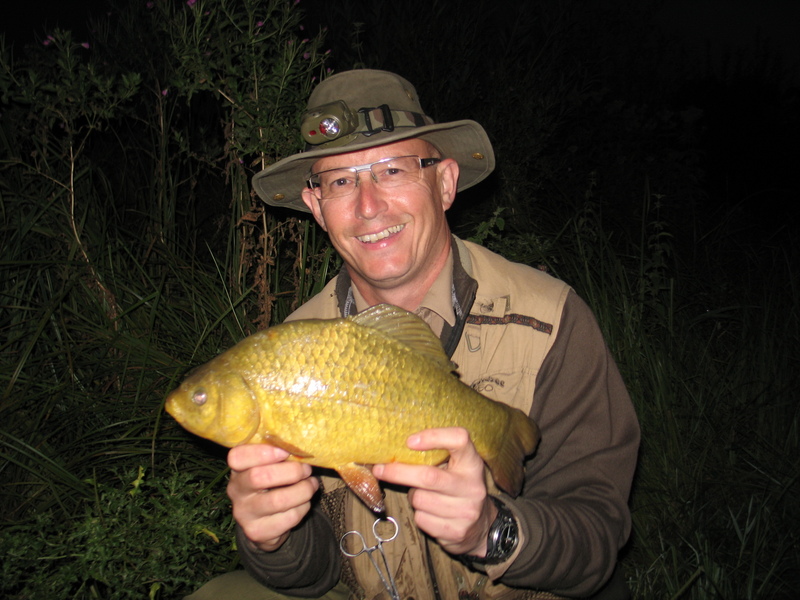 The first gave me a few crucians to 2lb 7oz (I think, although it may have been 2lb 9oz) and a solitary tench. The second session proved much more productive with 8 crucians all around the 2lb mark. I weighed one which showed 2lb 2oz on the scales and the others all looked to be of a similar stamp. I also had numerous tench to well over 4lbs. So all in all some good sport and it made a pleasant change from the blanks on the rivers! 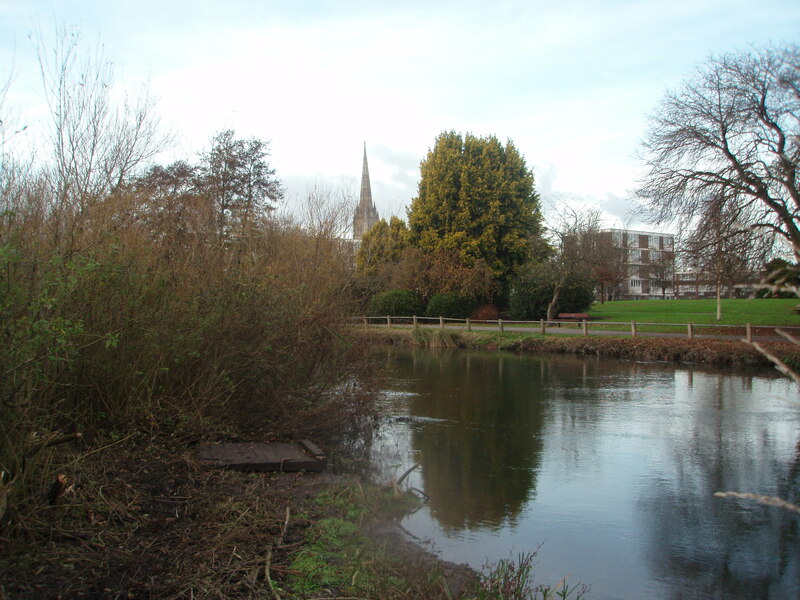 Geoff and I also decided to make the most of the benign conditions and head to Britford on the Hampshire Avon in search of some summer roach fishing. Armed with hemp and tares and the Drennan 14ft Matchpro Ultralight, plus light mainline and fine hooks we hoped we could tempt some of those big Hampshire Avon roach. Fishing two areas in particular, we soon had some reasonable roach boiling on the surface as they intercepted the hemp-seed. Most of the fish appeared to be on the small size and we hoped that as the day wore on the bigger fish would start to show. 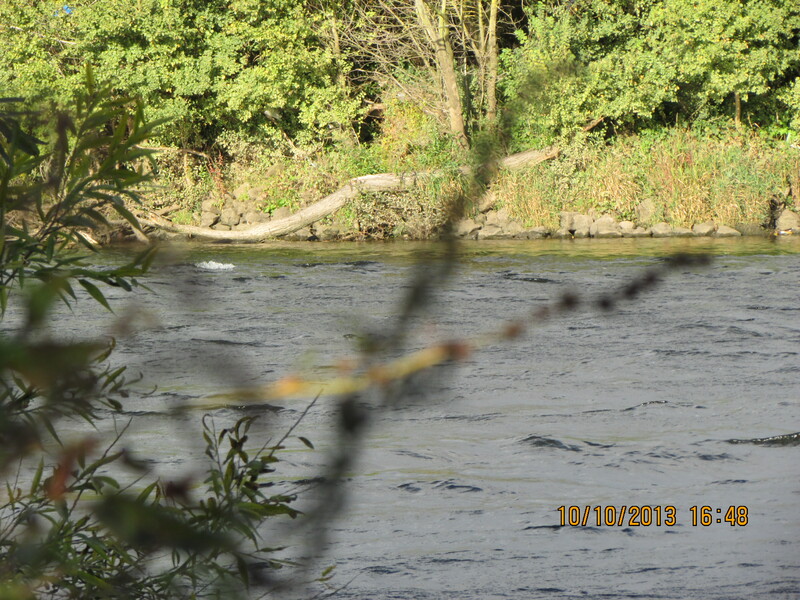 The river was gin clear and thick streamer weed choked most of the river. However there were plenty of clear spots in amongst the weed and plenty of gravel runs to be trotted. Presentation really was quite straightforward and the weed offered little in the way of hindrance. By constantly feeding hemp and running a single tare through on a small hook, bites came almost immediately. Both Geoff and I started to catch roach from the off. Not particularly big roach but quite a few of them. It was good fun and a few nice dace put in an appearance too. As the day wore on so the big roach started to show. They tended to hang back from the main shoal but they were still there in reasonable numbers. A few looked like big fish, probably in the 2-3lb bracket. There were plenty of fish well over a pound showing too. A handful of hemp had them boiling on the surface. When you see them like this you might be fooled into thinking it’s going to be a bit like taking candy from a kid, however the reality is different. A trick that did seem to work though was running the float below the main shoal so it passes them and gets to the bigger fish hanging back. Holding the float back allows the tare to flutter up enticingly in the water. Fortunately a big roach took the bait. A jagged fight ensued and the fish did the swimmers roll on the surface. As I grabbed the net it shed the hook. I seem to remember a string of obscenities wafting through the air on this beautiful summer’s evening. Hopefully they didn’t quite reach the Cathedral although the bells did start ringing! That fish looked close to two pound and would have been my first ‘2’. Still it’s there for another time. I continued fishing and missing bites and casting in the wrong place and getting tangled of course. Despite this there were plenty of fish to keep both Geoff and I occupied and a few around the 1lb-1 1/4lb mark. As the light started to slowly fade my patience evaporated! It was just one tangle too far. I had a severe tooth ache and had to keep taking very strong painkillers to keep it at bay and they were making me very tired and very irritable (even more than normal, if that’s possible). I finally snapped and so did the middle section of my beloved Drennan Ultralight. I feel most embarrassed about it but it was out of my control. Never mind a replacement has been sourced through Apollo Tackle at the Marsh Farm complex. Steve’s a real brick (? 🙂 ) and did me a good deal on a replacement. 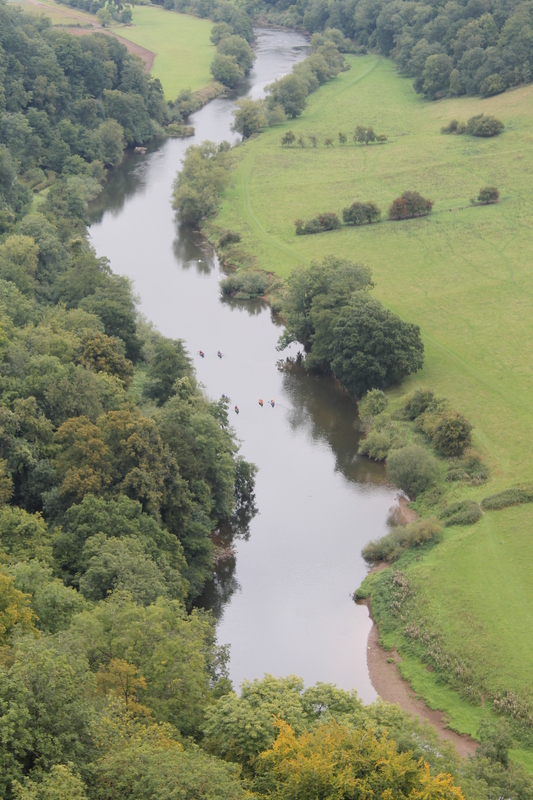 After that session I had a 3 day trip to the Wye with Geoff and an American friend who had never fished in the UK before. He has fished extensively in the US and also Scandinavia. I won’t go into details about it now because we are writing an article about the trip and how it compares to fishing in the States. So hopefully that will be available soon. 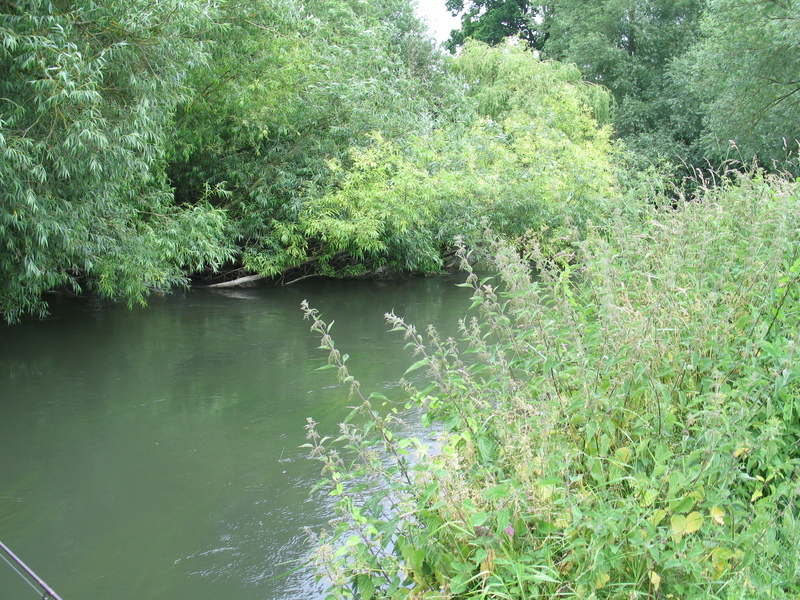 I then managed another trip to Berkshire to fish the Thames Tributary, which despite looking spot on never produced a bite for either Geoff or myself. We bumped into Paul Whiteing and Andy Myers who ended up doing rather well on the barbel and chub front. We discussed some ABF business before settling down to try and tempt a barbel. As the light began to fail so the mist started to swirl over the fields. It drew closer and closer before enveloping us in its cold and unearthly grasp. We were now wrapped up in our full winter clothing; fleeces, over-trousers, gillets and jackets and still the cold crept into our bones. We both resembled Nanook of the North! It felt about 8c and we remained biteless throughout the night, packing up around 11.30pm. Paul Whiteing had indicated that it was incredibly mild! That seemed crazy, however on walking back upstream we discovered the mist was absent from this area and the temperatures were much, much higher. When we arrived back in the car park the car thermometer was showing 13c. We stripped away all of the cold weather clothing and enjoyed a nice cuppa by the cars in just shirt and trousers and were very comfortable in the early autumn air. Just goes to show how conditions can vary and how they affect the results. The following day we headed to the Kennet to target the Benyons. We didn’t want to be leaving there very late, hoping to head home around 8.30-9.00pm. We arrived at the river a little later than expected at around 11am. I wandered downstream whilst Geoff headed upstream. We thought this might provide a contrast and if one area produced the other could always move. I baited up a deep marginal swim with some hemp and fished the inside line. It was a good 7ft deep and offered loads of bankside cover, with overhanging trees and undergrowth hopefully sheltering a few fish. Sadly it appeared to be quite snaggy and after a few hours of inactivity I felt a move was in order. 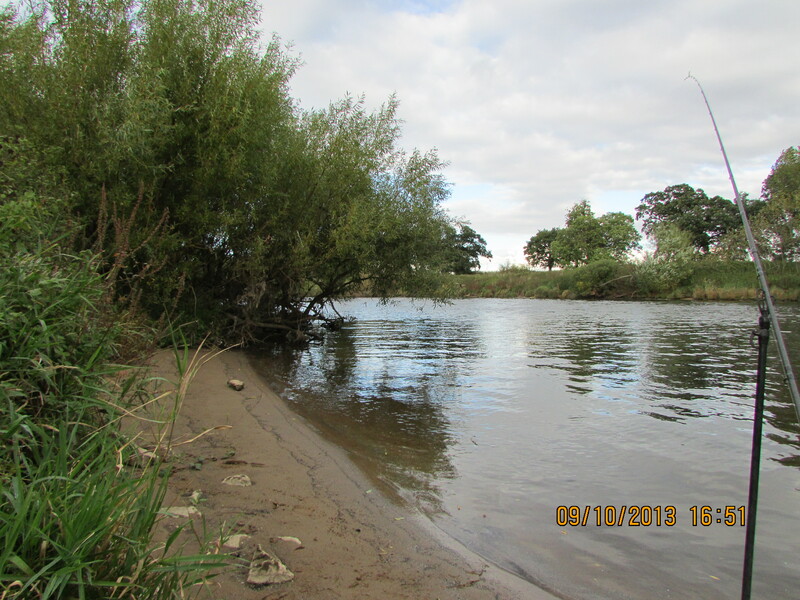 I checked out a few likely looking swims with a rod to plumb the depth and feel what the riverbed was like. I finally plumped on a nice spot which had a deep run under a overhanging tree and a far bank line of trees where the flow offered an enticing crease. I decided as the day wore on to concentrate on the far bank run. This looked the best spot; it had a good flow and lots of cover and seemed an ideal interception point. I baited the tree line up with catapults of hemp and then fished a block end feeder with hemp and two elips pellets on the hair. It was beginning to look like yet another blank when there was a bang on the rod top. At last a sign of life! Perhaps it was just a chub investigating the bait but who knows? Around 10 minutes later with the light fading fast, the rod top started to dance. I was fishing upstream with a bow in the line and this was an all out bite. I grabbed the rod and pulled into the fish. It was solid and nothing moved. I could then feel a thump from something on the other end and this fish started to power off on a very slow and determined run, taking line from a begrudging clutch. As I pulled back the fish seemed to get stronger and just hugged the bottom. I honestly thought it was snagged for a while and then started to realise it was in fact just a good barbel on the other end. I managed to coax it eventually to the nearside bank where it headed straight for a sunken bush. With steady pressure I easily kept it away from any real danger and suddenly the fish popped up on the surface. I made the most of this opportunity and managed to slip the fish straight into the waiting landing net. Phew what a relief. 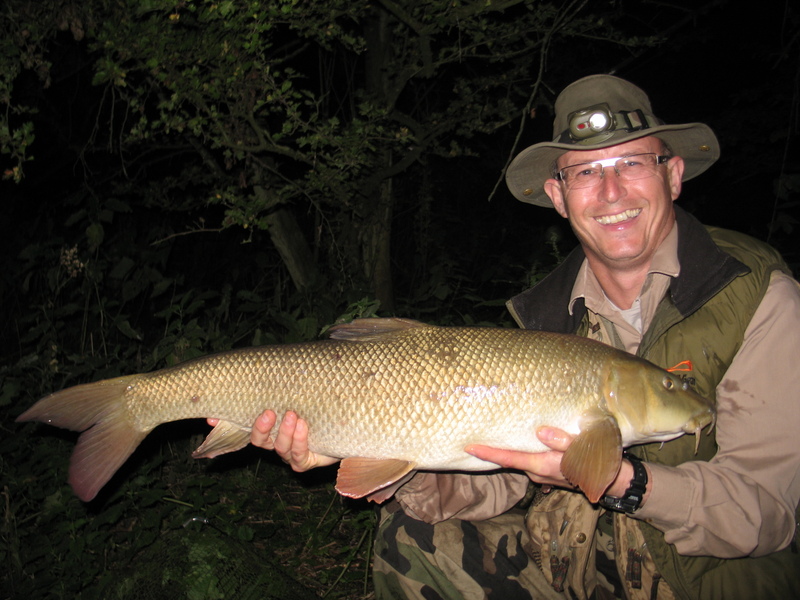 At last a barbel and a decent one at that. I quickly called Geoff and informed him of my catch and said it looked 13lb+ possibly even 14lb I thought. I waited for Geoff to wander down and then we weighed and photographed a magnificent Kennet barbel in beautiful condition. The fish tipped the scales to 13lb 3oz and was my second biggest Kennet fish to date. With that the rain started and as it was already about 7.45 we decided to call it a day and head home before the weather turned really nasty.